Rune Scale is set in a world ruled by dragons. Humans survive by their wits and through the use of alchemy, a mysterious magic possessively controlled by the secretive Alchemists Guild. Andrew Condign is an ordinary man with dreams of a better world, where humans can live without the constant fear of dragon attacks. In pursuit of this goal, Andrew finds himself in a race against time as he scrounges for scraps of knowledge and sets out on the most dangerous quest imaginable. 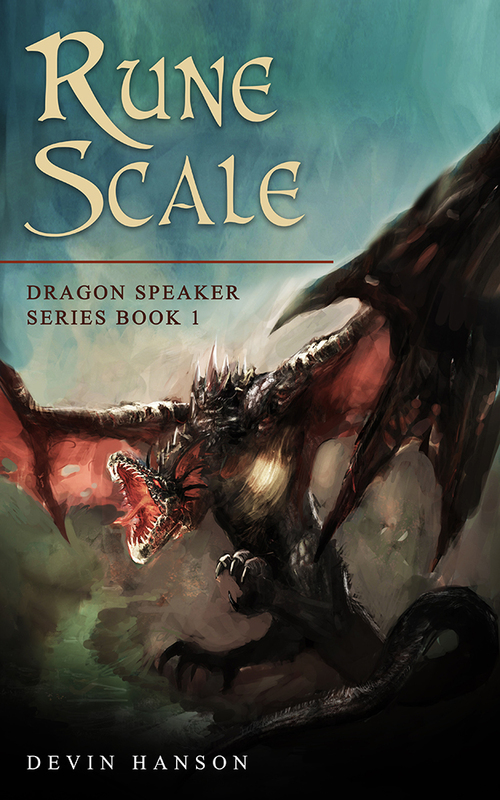 Rune Scale is the first in the Dragon Speaker series. I really liked this book. I was caught into the story right from the start, which is important to me in a book. I had absolutely no attention on the writer, meaning that I could just dive into the story and be in the story, without being distracted by the writer. I loved the story and the characters, and loved the twist that comes near the end. Very fun! The author takes us on an adventure with his characters. Andrew and Jules are our protagonists, they are like-able and written with some depth to their personalities. I feel we’ll get to know them better as the series progresses. Another great aspect of this book is the world the author created, it’s people and their culture and the detailed and original magic system that live in his world. Well worth your time and money! Hanson is a young, new author and he deserves your investment! I was skeptical when I started this book, but as I continued, I came to fall in love. Full disclosure: this book starts slowly. But less than 1/4 of the way through, the characters are established and the story takes off. There was a small foot-dragging at the outset which vanished after about 2 hours’ reading. I am not a reader of steam-punk/airship/dragon-style fantasy, but I have read a LOT of fantasy. I enjoy Hanson’s commitment to his characters’ personalities and I his magic system is well-developed and thoroughly considered. The world is believable, and that’s not always true of unique magic systems – Hanson has obviously given his world and its history due diligence, and I like the culture he has developed for the world. Steampunk? Dragons? Unique magic system? New, indie author? Look no further — buy this book!